Passion, chutzpah, and bikes? 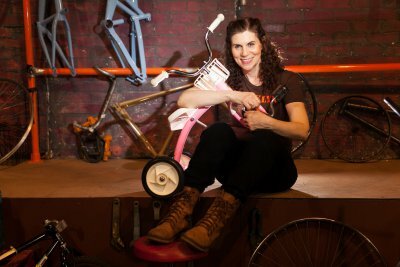 The talented Elizabeth Barkan comes full circle in this heartwarming and witty musical proving that the cliché is true: If you fall off your bike, get back on. 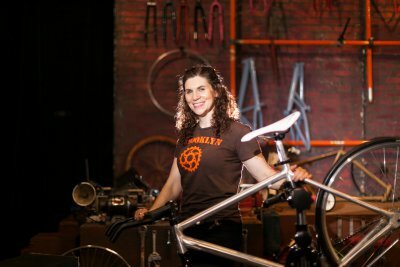 A musical about life in a Brooklyn bike shop… what will they think of next? Walking into BIKE SHOP, created, written by and starring Elizabeth Barkan, I wasn’t sure what to expect. The stage is set with bicycles from NYC Bikes in Williamsburg, Brooklyn, and designer Mark Marcante re-creates the hustle and bustle of a bike shop, furnished with tools, workbenches and equipment, to bring the story to life. To lyrics by Caroline Murphy and music by Youn Young Park, Barkan makes her entrance (on a bike, of course) as the energetic and adorable Bobby who shares her passion with us for her career as a former bike messenger. Barkan doesn’t hold back as she expresses herself through song and dance to share her personal journey. The opening number “Streetwise” is a burst of exhilaration and adventure and pumps the audience up for what’s to come. In addition to the hilarious and entertaining moments, the climax is a literal bump in the road that causes her story to turn somber and results in Barkan hanging up her helmet and retreating to her family’s bike shop as she works on healing emotionally after a tragic accident. The audience is left with one question on their minds: Will she ride again? Under Gretchen Cryer’s meticulous direction, Barkan wears many hats as she portrays the characters of her wise grandmother, the witty Uncle Rabbi, and others with much finesse. Her charisma and willingness to take risks is not only admirable but stretches her already impressive range of talent to new levels. Her voice is lovely and full of emotion as she belts out ballads such as “I Fix Things” and “Can You Feel the Music.” Barkan is accompanied by The Bicycle Band, which features Dennis Bulhões on drums, Phil Smith on bass and musical direction/piano and additional music by Gerry Dieffenbach, to create a dynamic sound. While the gentlemen are extremely talented and add dimension to the performances, there were moments where it was hard to hear Barkan over the music. Choreography by Sue Samuels incorporates elements of Barkan’s training as a Certified Group Fitness and Indoor Cycling instructor for an authentic treat. It is incredible to watch Barkan sing and dance on a spinning bike, as she keeps balance and poise the entire time. Those who spin will understand how difficult a task it is to multitask (and maintain your breath) while riding a bike, but Barkan makes it look effortless. The honesty in which the story is told is heartwarming and a lovely reminder that just like falling off a bike, we must dust ourselves off and get back in the game after a setback. Barkan explores the depth of her emotions as she hides away to deal with it all. Her Irish grandmother (who founded the shop) comes to her and reminds her of all the chutzpah she possesses. In the end, the twist on the uplifting personal success story is a fun and innovative one, as passion and strength re-emerge. Join the ride! Sean Patrick Monahan’s performance is the main reason to see this clever, fun, camp and deliciously mean-spirited show. A young girl is pushed to the brink by society with potentially fatal consequences. With little hope otherwise, is violence the only way forward?